Blessed Kateri. Other parishes across the Diocese are getting excited about the canonization, too: For example, at Our Lady of the Snow in Grafton/Berlin, special Masses are planned and worship spaces will be decorated with Native American items and artifacts. 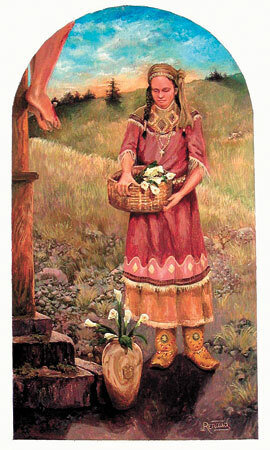 MR. RENAUD’S DEPICTION of Blessed Kateri. For details on the shrine’s canonization day events and parking, see www.martyrshrine.org, call 853-3033 or email beth.lynch@martyrshrine.org. Bus parking capacity at the shrine has already been reached; bus groups can still arrange off-site parking. Blessed Kateri Tekakwitha's birthplace, the Shrine of Our Lady of Martyrs in Auriesville, is gearing up for a possible 1,500 visitors on the saint's canonization day Oct. 21. A special 2 p.m. Mass in the shrine's coliseum will replace its normal Sunday Masses. The museum and visitor center will open at 10 a.m. and feature documentaries and exhibits, as well as a meet-and-greet with award-winning upstate New York artist Bob Renaud, whose painting of Blessed Kateri is part of a Vatican collection. The shrine has been receiving more calls than usual from around the Diocese and the country as the day approaches. "It's a very big event for the Church, let alone for the Mohawk Valley and the Diocese," said Beth Lynch, museum manager and event coordinator at the shrine. Callers and visitors are "excited because this is 'their Kateri.' It's a very personal thing for people - and, for many people, it's a validation" of their faith that the Mohawk maiden would become a saint. Ms. Lynch said the whirlwind of activities and attention that news of Blessed Kateri's canonization brought to the shrine in the past year has strengthened her own devotion to the 17th-century Catholic convert. For her own part, Ms. Lynch said, "I've learned a deepening of my respect for other people in their love for Kateri. It's very endearing. It's very humbling." Witnessing especially the "intense faith" of Native American Catholics when the shrine hosted the annual Tekakwitha Conference this summer was "just so moving and faith-affirming," she added. "They knew who she was all along." 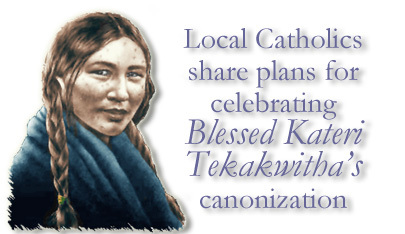 Ms. Lynch encouraged pilgrims to spend the hours before Mass on canonization day to explore the grounds, pray and learn the details of Blessed Kateri's life, which make her sainthood "even more exciting and real." The Mass will mark the end of the shrine's 2012 season until its spring opening next April. As Rome and Auriesville celebrate Blessed Kateri Tekakwitha's canonization day Oct. 21, St. Margaret of Cortona Church in Rotterdam Junction will get in on the act. St. Margaret's, a mission church of St. Joseph's parish in Schenectady, will invite more than a dozen Native American community members to its 9 a.m. Mass, where Mass-goers will be treated to flute and water drum music and special prayers relating to the new saint. Parishioners will process into the sanctuary with a three-foot statue of now-St. Kateri, which was hand-painted in bright cerulean and gold by a parishioner over the summer. The statue will be unveiled and blessed during the Mass, which will be celebrated by Rev. Michael Hogan, pastor. The eucharistic gifts will be presented along with symbolic Native American gifts of tobacco, sage, cedar and sweet grass. One Native American community member will sing an honor song in the Mohawk language; another will give testimony about St. Kateri's effect on his life. Parishioners and visitors will receive special prayer cards and programs commemorating the occasion. Jack Pudney, a St. Margaret's parishioner who helped organize the special liturgy, didn't have a special devotion to the new saint - until the news of her canonization was announced last December. Then "something turned on," Mr. Pudney told The Evangelist. His church's proximity to Auriesville and Fonda - respectively, Blessed Kateri's birthplace and baptismal place - inspired him to do something special to celebrate her sainthood. "We can't let this moment pass us by," he declared. "It's too precious and too important." Paula Ross, a St. Margaret's parishioner of Algonquin descent, couldn't agree more. She plans on donning a black ribbon shirt and Cherokee tiered dress in black, white, yellow and red (colors representing the "four races of man" and unity). She says the Mass will be a chance to show off her heritage to her faith community. "I've always separated the two sides of myself," Ms. Ross said. "If I was in a Catholic church, I didn't talk about my native heritage - and vice versa. For me, [the canonization] is like bringing the two sides together. "You don't have to separate them," she continued. "You find what works for you, and you don't have to be ashamed of who you are." Ms. Ross knows close to 50 other Native Americans who live in the Albany Diocese. She attends three or four powwows a year in the northeast, visits Auriesville and speaks at local schools about native culture a few times a year. She said children of all cultures are searching - and native ideals can help. "Children are broken today," she said. "They don't know how to just be and understand what their spirit wants. Their eyes are so thirsty to find out some way to find out who they are and why they're here on this planet." Adults are no different, she added, and Blessed Kateri's example can help people find peace: "This [canonization] happening at this time isn't a mistake." Ms. Ross hopes the St. Margaret's Mass will educate people and honor Blessed Kateri, as well as "ancestors along the Mohawk, for their contributions to the world." She also hopes the canonization will smooth resentment by Native Americans who feel the Church contributed to the loss of tribal culture. "Now's the time: Let's just let it go," Ms. Ross said. "Let's try to have this be some kind of healing. We're not going to get anywhere if we remain angry, if we remain stuck." Mr. Pudney hopes the Mass will open non-Native parishioners' eyes to "see and appreciate the beauty of Native American Catholics. I want it to evangelize the traditional, straightforward, our-way-is-the-only-way Catholic folk."